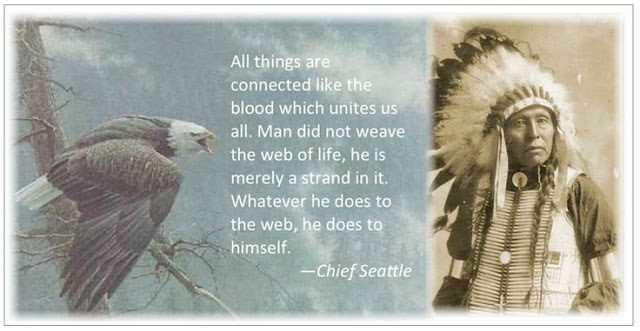 Chief Seattle (1780 – 1866) was a prominent native American chief who pursued a path of peace with colonial white settlers in what is now the state of Washington. During treaty negotiations in 1852, he gave a famous speech in response to an offer by the U.S. Government to buy two million acres of Indian lands. with his outer animal nature, unlike many of us today. Are his prophetic words coming true in America today? Although its authenticity has been questioned, Chief Seattle’s speech (see video and text excerpts below) has become known worldwide as the most beautiful statement on the environment ever made. Yet many people fail to see that it’s much more: It’s a treasure of native American wisdom that reveals the great “secret” of life on earth. This secret was known to all native America Indians and to all ancient and indigenous peoples. The secret is that Nature is endowed with divinity and spirituality. More importantly, we are too — but we fail to see it (i.e., our inner “soul” is divine). In a 1984 interview with journalist Bill Moyers, mythologist Joseph Campbell narrated parts of Seattle’s speech for a documentary the two were producing titled The Power of Myth. Here is a 90-second video clip of that beautiful and powerful narration. “The president in Washington sends word that he wishes to buy our land. But how can you buy or sell the sky? The land? The idea is strange to us. Every part of this earth is sacred to my people. Every shining pine needle, every sandy shore, every mist in the dark woods, every meadow. All are holy in the memory and experience of my people. We are part of the earth and it is part of us. The perfumed flowers are our sisters. The bear, the deer, the great eagle, these are our brothers. Each ghostly reflection in the clear waters of the lakes tells of events and memories in the life of my people. The water’s murmur is the voice of my father’s father. The rivers are our brothers. They carry our canoes and feed our children. If we sell you our land, remember that the air is precious to us, that the air shares its spirit with all the life it supports. The wind that gave our grandfather his first breath also receives his last sigh. Your destiny is a mystery to us. What will happen when the buffalo are all slaughtered? What will happen when the secret corners of the forest are heavy with the scent of many men and the view of the ripe hills is blotted by talking wires? The end of living and the beginning of survival. When the last Red Man has vanished with this wilderness and his memory is only the shadow of a cloud moving across the prairie, will these shores and forests still be here? Will there be any spirit of my people left? In his profound and poetic words, Seattle gives us a glimpse of the indigenous Indian “divinity-in-nature” worldview. Also conveyed is the native American belief that man in his innate nature is divine. Did Seattle have a vision of America in 2012? I’m not talking about the recent economic downturn or the 2012 doomsday scenarios. I’m talking about how we’ve removed ourselves almost entirely out of Nature, and, as a result, we have lost our connection to our Mother, and to who we really are inside. We may attribute the origins of our estrangement from Nature to the influence of the Hebrew Bible which teaches us that Nature was created for us to exploit. The attitude of some modern scientists is also to blame. Science approaches the natural world with a view to understanding it and ultimately controlling it and making it serve us. By contrast, ancient and indigenous cultures like the American Indians did understand the workings of Nature; they did recognize and respect the influence of the sun and moon, the regularity of the seasons, and the weather portents — good or bad — written in the sky. They respected the flow of Nature and they knew that Nature is greater than man; that it is only in Nature that we can find our true spirituality. Ancient and indigenous peoples worldwide recognized that Nature is divine, just like Man. Having removed ourselves from Nature, Americans seem to have now ceased to “live” and begun only to “survive,” just like Chief Seattle predicted would happen. Most of us don’t even realize it. The American lifestyle — the constant pursuit of money, luxury, fancy cars, big homes, entertainment, and different bodies than we were born into — is in many ways contrary to Nature. Yet the American people aren’t to blame; the American lifestyle is being “dictated” by the mass media and the corporate sponsors of the mass media. Americans are simply buying into it. If Seattle was alive today, he would probably tell us that we have lost the way and that we are far from home (our Natural home); but it’s hard for us to see this. The greatest irony is that we think we are free. We think because of our technology that we live in the greatest era in human history, when in reality we may very well be living in the darkest of ages. It takes a strong mind to see this, an “awakened” and “freed” mind to see how our departure from Nature has really meant exactly what Seattle said it would: The end of living and the beginning of survival. Nature speaks a universal language that everyone can understand, no matter what part of the earth a person lives on, or what faith, nationality, political persuasion, age, profession, or income. Nature holds the great secret to life. “If the Earth were only a few feet in diameter, floating a few feet above a field somewhere, people would come from everywhere to marvel at it. People would walk around it, marveling at its big pools of water, its little pools and the water flowing between the pools. “People would marvel at the bumps on it, and the holes in it, and they would marvel at the thin layer of gas surrounding it and the water suspended in the gas. The people would marvel at all the creatures walking around on the surface of the ball, and at the creatures in the water. “The people would declare it precious because it was the only one, and they would protect it so that it would not be hurt. The next time you feel stress, worry, fear, loneliness, grief…then go outside and find a place in Nature where you can see trees, a stream or river, the sky, the sun, the clouds. Walk in it, sit in it, admire it, touch it, stay for a while and reconnect. Only then will you see life as it should be, amidst the simple beauty and majesty of Nature. Your fear will melt away and the right path will present itself before you. Many people have since questioned the details of Seattle’s speech. The doubters of its authenticity don’t realize that the view itself is what’s authentic and that’s what is important. As for the greatness of Chief Seattle, even the white settlers knew it; Seattle, Washington was named after him.